Assistant Minister for Infrastructure Hon Michael McCormack (Left) and ANCAP CEO James Goodwin (right). 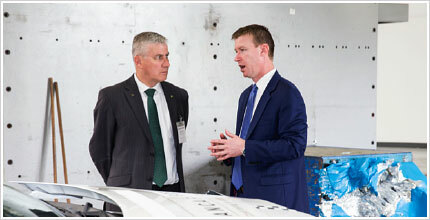 The newly appointed Commonwealth minister responsible for road safety, Assistant Minister for Infrastructure and Regional Development, the Hon Michael McCormack has shown his interest and commitment to ANCAP by attending a crash test in early December 2015. ANCAP CEO James Goodwin briefed Assistant Minister McCormack on the crash test program and broader road safety issues before observing a frontal offset crash test at the Crashlab facility in Sydney. "It was very encouraging to see Assistant Minister McCormack take time out of his busy schedule to attend the crash test and learn first-hand about ANCAP's important role to improve the safety of vehicles on the roads," said Mr Goodwin. "Only a few months into his new portfolio, McCormack is already a strong supporter of ANCAP and a road safety advocate so we look forward to a productive working relationship with him," he said. Part of the Australian Delegation at the 2nd Global High Level Conference on Road Safety with Assistant Minister Michael McCormak (3rd from left). 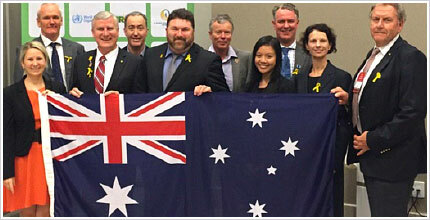 ANCAP Representatives were Technical Manager Michael Paine (6th from left) and Deputy Chair Lauchlan McIntosh (far right). Photo taken from Minister McCormack's Twitter page. Australia had high level representation at the 2nd Global High Level Conference on Road Safety, held in Brazil on November 18th-19th 2015. The conference brought together UN member states, UN organisations, intergovernmental organisations, NGOs and the private sector to discuss global road safety issues. A key focus was review of the Decade of Action on Road Safety (2011-2020), its achievements, how to accelerate progress, and the next round of global targets. The final version of the Brasilia Declaration for Road Safety was agreed upon and can be found of the World Health Organisations (WHO) website here. Assistant Minister Michael McCormack attended the conference, confirming the government's focus on road safety. The minister was very involved and active during the conference, engaging with numerous organisations and stakeholders in road safety from around the world. ANCAP was represented by Deputy Chair Mr Lauchlan McIntosh and Technical Manager Mr Michael Paine. 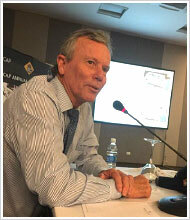 ANCAP Technical Manager Michael Paine speaks at the conference. Photo taken from Minister McCormack’s Twitter page. 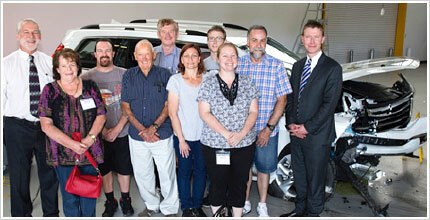 NRMA's Jack Haley (far left) and ANCAP's James Goodwin (far right) with the eight NRMA competitions winners. ANCAP and NRMA Motoring and Services joined forces this year with a competition for members to win one of five double-passes to attend a crash test, usually off-limits to the public. The competition was advertised in member magazine Open Road and the initiative aimed to promote the NRMA's long-standing relationship with ANCAP, reward NRMA members and promote the importance of checking a vehicle's ANCAP safety rating before purchase. ANCAP CEO James Goodwin provided an overview and history of the organisation and what they should look for when buying their next vehicle before they went on a tour of the Crashlab test facility to observe a frontal offset crash test. All participants were highly engaged with the program and the event was a great success. ANCAP Chair Wendy Machin presents at the International Driverless Cars Conference, Adelaide. 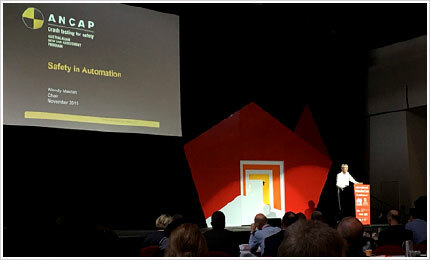 ANCAP played a key role at the recent International Driverless Cars Conference held in Adelaide in highlighting the safety benefits of vehicle automation. Driverless cars have been a much discussed topic over recent months, with many discussions taking place on what this means for the future of road safety. The Conference was held in Adelaide 5-6 November 2015 and brought together a range of delegates to discuss and showcase driverless cars and vehicle autonomy. ANCAP Chair Wendy Machin presented on the first day of the conference on what autonomous technology is already available in many vehicles to improve road safety and the challenges that exist to build community confidence in the technology. The presentation received great interest with many delegates engaging in Q&A discussions. South Australia is positioning itself as a key player in the autonomous vehicle industry, with the Australian Driverless Vehicle Initiative coming to fruition with the support of many key industry players. A public demonstration of a Volvo driverless car was held during the following days of the conference, showcasing the technology and how it will work on Australian roads. ANCAP has welcomed a positive step to improve road safety, new legislation to improve design standards for side impact crashes. A 4 star ANCAP safety rating has been released for the new medium SUV, the Hyundai Tucson. This rating applies to the 2.0 litre GDi petrol two-wheel drive variants that have been available to the Australian and New Zealand markets since August 2015. There have been some changes to the ANCAP board with Lyn O'Connell stepping down in October. Ms O’Connell was formerly Deputy Secretary, at the Federal Department of Infrastructure and Regional Development and has now moved to the Department of Agriculture. Ms O'Connell has been replaced on the board by Judith Zielke, Executive Director, Surface Transport Policy Division at the Department of Infrastructure and regional Development. We thank Lyn for her contribution to ANCAP over a number of years and welcome Judi to the board. The U.S. Department of Transportation, its National Highway Traffic Safety Administration (NHTSA), and the Insurance Institute for Highway Safety (IIHS) have announced that ten major vehicle manufacturers have committed to making autonomous emergency braking (AEB) a standard feature on all new vehicles. This is a major step forward in the quest to have more advanced safety features made standard, rather than a costly, optional extra. The 10 companies — Audi, BMW, Ford, General Motors, Mazda, Mercedes-Benz, Tesla, Toyota, Volkswagen and Volvo — will work with IIHS and NHTSA in the coming months on the details of implementing their historic commitment, including the timeline for making AEB a standard feature. The Department and IIHS encourage all other light-vehicle and trucking manufacturers to bring automated vehicle technology to all vehicles on U.S. roadways as soon as possible. 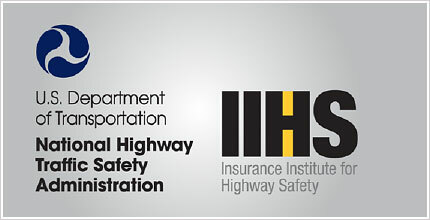 National Highway Traffic Safety Administration (NHTSA) 5-star safety rating system has proposed a number of changes to the system. The star rating system would go up in half-star increments, including the addition of points for crash avoidance technologies, pedestrian protection and an additional frontal crash test. These are positive changes to the current system, and should they be approved, will come into force for 2019 model year vehicles. 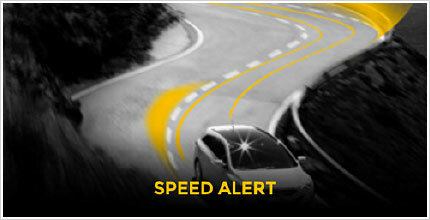 Information on a range of safety assist technologies can be found at Understanding Safety Features on the ANCAP website. Why doesn’t ANCAP test for rear end collisions? Severe rear collisions are relatively rare and usually involve being struck by a much larger vehicle. Frontal crashes and severe side impacts account for most car occupant fatalities which is one reason why ANCAP concentrates on these crash types. The University of Adelaide published a report on rear end crashes, and based on the recommendations of that report, in 2011 ANCAP began conducting whiplash tests, which are based on the assessment of vehicle seats. Well-designed seats may reduce the risk of rebound injuries where the driver is thrown forward and strikes the steering wheel, after the initial impact from the rear. Learn more about ANCAP's whiplash protection testing at Crash Testing Explained. Is there a baseline speed at which the front airbags should deploy? Airbags are designed to be supplementary restraint systems. They work in conjunction with seat belts to reduce the risk of injury to occupants. Airbags do not trigger in some low-severity crashes where the seat belt offers sufficient protection. Vehicle manufacturers go to considerable effort to determine the optimum conditions for deploying the airbags. There is no general set speed limit for airbags to deploy as you propose, however the Australian Design Rules (ADRs) do set regulatory requirements for crashworthiness that vehicles must meet. ANCAP uses a range of internationally recognised crash tests and safety assessments. Typically the tests ANCAP conducts are more demanding than those required by the ADRs. Information on the tests conducted by ANCAP can be found at ancap.com.au/crash-testing-explained. Detailed information on the test protocols can be found at ancap.com.au/technical-protocols-and-policies.